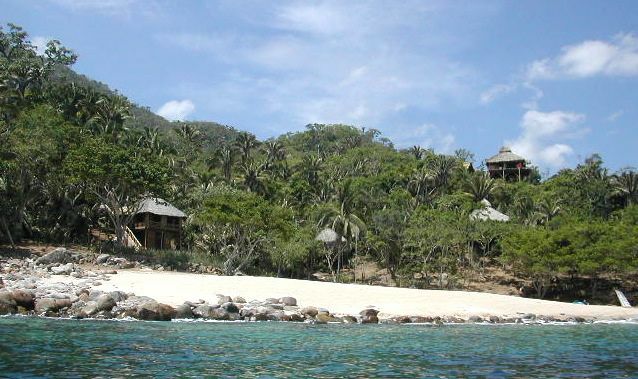 On virgin sand cove beaches, along the scenic jungle hill shore of Banderas Bay, Mexico, since 2002 Los Chonchos Beach has developed as a beach front eco retreat of 24 thatched roof vacation homes of American owners. 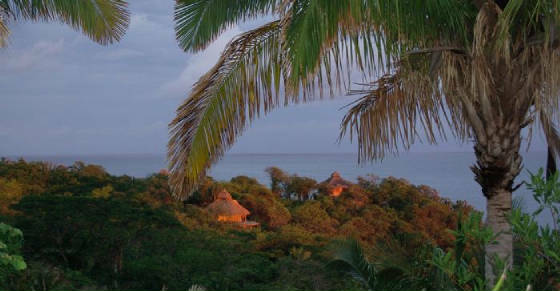 When not occupied by the owners, a few bungalows are managed by the Los Chonchos developer and offered as the vacation rental. A total of 3 intimate beaches stretch along a half mile seashore bordered with subtropical flora and rocky cliff formations. Truly secluded and just an hour boat trip from the city of Puerto Vallarta, Mexico, Los Chonchos offers a beach vacation experience seldom found. Private Beach House Vacation Rentals. Secluded beachfront near Puerto Vallarta, Mexico. Our private beach house oceanfront rentals are located on the secluded beaches along the picturesque seaside of Bandera's Bay one hour boat ride from Puerto Vallarta, Mexico. If you seek adventure travel mixed with solitude, peaceful escape in accord with comfort, if you love pristine private sandy beaches and being one-on-one with nature, you will find it all in Los Chonchos Beach. Are you looking for a tropical beach adventure travel? How about jungle trekking, whale watching, swimming with gigantic manta rays, sea kayaking, snorkeling with innumerable colorful fish around the rocks, or better yet, in the nearby cave? If you are looking for a tropical private beach adventure travel or just to relax at the secluded eco retreat, we invite you to stay with us. We are one of those secluded castaway private beach house vacation rentals that must be experienced to be fully appreciated.